The first giveaway I will do is this little painting I made with all my love and heart. What you have to do is write a comment about why do you like to win this painting in my blog (please it needs to be in my blog) and like my post in my Facebook page. Good luck to all and I will announce the winner next Monday, August 13. And thanks for the opportunity!!!!!!!!!!!!!!!!!! Thanks to you, Janice !!! You put a smile on my face !! i would LOVE to win this because i love your work (everything you do! ), this is gorgeous, and i love sacred hearts and everything they represent. also, my husband and i are hoping to eventually buy our first house; i'd love to take this with us! I am a big fan of your work Lorena. I would love to win this amazing piece to add to my collection at home. It would a great addition to my wall of favorite artists. Love your use of colors. Coming from someone who uses color incredible, it is a big complement! Me too! I love your work and love that it is influenced by the beautiful and colorful Mexican culture. The answer to her is simple for me, this painting makes my heart sing! I am a believer in true love and also that love is eternal. 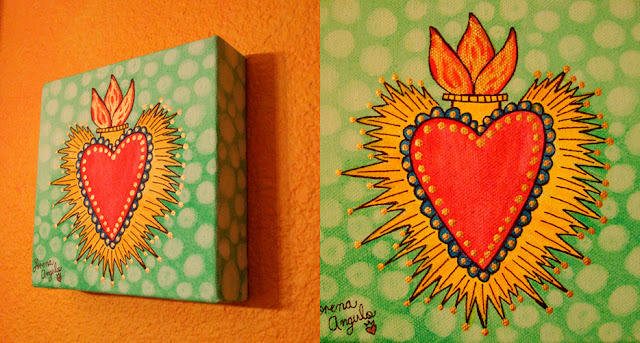 I am inspired by the image of the sacred heart because it has always given me hope that I would find my one true love. I also am moved by the image because it evokes deep feelings of love for my grandmother. She was a wonderful, religious woman who took care of her family and showed me in life and in death, that our love for eachother will always be in our hearts and souls and that we will see one another again. The image of the sacred heart has always been a part of my life in a way that goes beyond just what it means...it has been a feeling so strong, a bond so deep, and a way of life for me. Thank you Lorena for all you do to inspire! Your work is very inspirting! I love your choice of bright vibrant colors and your style is very appealing to the eye. Your painting would be a great collection to add to my Mexican hacienda style home. Thanks for making a powerful and influential impact among the Latina arts and for keeping Latino art alive!